Multiple sources, including several AppleInsider readers, are reporting that iPhone X deliveries once scheduled to arrive at the end of November have either already shipped, or are in the final phases of the preparatory process and will arrive much sooner than predicted. Reader Warren ordered a 64GB iPhone X in white, using the iPhone Upgrade Program. In an email, Warren reports that the original arrival estimate was Nov. 17 through Nov. 24. The reader reported that he received a notification from Apple that his iPhone X has shipped, and will arrive on Nov. 6 —as opposed to more than two weeks after release day. AppleInsider reader Richard reports a similar account. 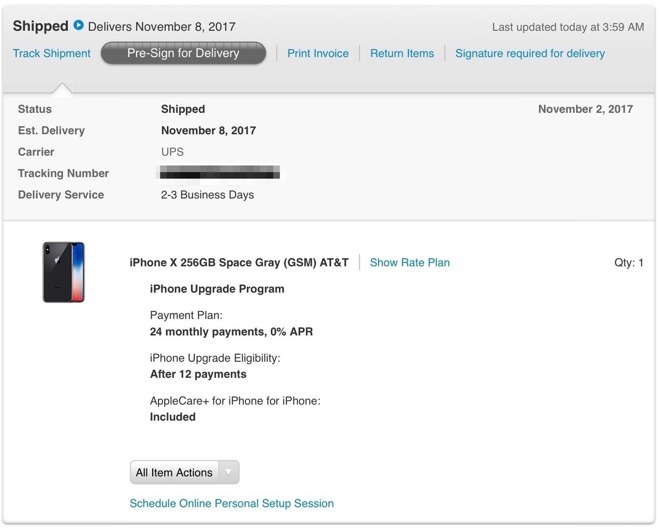 Richard's receipt window for an unspecified model of iPhone X was also listed as Nov. 17 through Nov. 24. However, instead of an update from Apple in an email, the reader reports that the credit card for the order has been charged for the full amount —which is generally an indication of shipment that day or the next. David ordered a 256GB Space Gray iPhone X. Receipt was also expected between Nov. 17 to Nov. 24, and an update at 4 a.m. from Apple declared the unit as shipped, with an arrival in two to three business days. Many reports from orderers on Twitter also note that the order is arriving much sooner than expected. The reports span configurations, orders from Apple directly, and orders from carriers. The seemingly near-universal earlier deliveries suggest that Apple is in receipt of a large number of phones, possibly earlier than predicted when pre-orders went live on Oct. 27. Apple's first OLED iPhone X retails for $999 and up. Lines at Apple Retail stores have already formed for what is expected to be a limited supply of the unit.